Maybe because it was my last stop for the day or maybe it was because I’m absent minded by nature but the other evening I found myself standing in the frozen food aisle of Trader Joe’s utterly confused. I had stopped to pick up a few things for the next day’s dinner. We were having friends over and I wanted it to be special. I had grabbed some lemons, an eggplant, and a potted basil plant that swayed when I pushed the cart. Near the back corner of the store the demo station was winding down for the night but left on the counter in miniature paper cups were slices of dinner rolls. I parked my cart off to side and picked up one of the cups of white processed sweet wheat. Devouring the bread sample, I grabbed my cart and headed toward the frozen food aisle to get a bag a frozen chicken when I looked down and saw this. 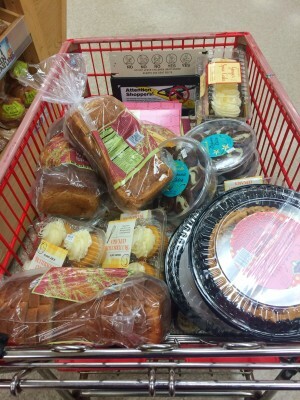 My cart was piled high with of loaves of bread, cupcakes, pies, and other sweets. Where was my eggplant and basil? Whose cart was this? Then it occurred to me that it may be mine. I seriously contemplated the possibility that I had absent-mindedly wandered through the store and subconsciously picked up all this carby goodness. Crazy thoughts like this aren’t really so crazy when you are up to your neck in sugar addiction. I haven’t been writing much here lately. Driving to Alaska, taking care of our new baby, keeping our two older homeschoolers on task are all part of my absence here but I’ve also been guzzling sugar like M&Ms are going to be discontinued tomorrow. Then to add to the fire or should I say “lack of” my workout schedule has all been but nonexistent. I’ve gone back to the “dark days” of pre-2008 (<==my take on nutrition has also changed a bit since). The time when I hid outside my house and drank cups of maple syrup. The times when I would steal candy from my kids. There is some light in the chocolatey darkness. I’m not depressed like I was seven years ago. I’m not happy about this struggle with sugar but I’m not dealing with a true depression and would never want to minimize those who struggle with clinical depression because I’ve been there and it’s serious. Overall, more days than not, I feel pretty dang balanced and quite often downright peaceful. But but but…there is this uncontrollable urge to consume sugar and my question is why? Is it emotional? Physiological? A combination? A few weeks ago I kept a record of how I felt when I ate sugar and discovered…there was absolutely no pattern. None. I ate sugar when I was excited. I ate sugar when I was bored. I ate sugar when I was feeling aloof. I ate sugar when I was happy. I ate sugar when I wanted to procrastinate. I ate sugar when I was feeling peaceful. I ate sugar because it was a beautiful day and I wanted to add to my pleasure. I ate sugar because “it was there”. The last time I combatted my sugar addiction I gave up sweets cold turkey on New Year’s day 2008. During that time I “graduated” myself from “no sugar” to “homemade treats made with unrefined sugars”. It worked beautifully and I rarely felt deprived until I was sabotaged by the Boy Scouts and then again by Halloween when I picked up my first piece of candy in nearly four years. It didn’t take long for that bite sized piece of corn syrup to turn into an avalanche of sugar. Before those M&Ms melt in your mouth and not in your hand, I was right back where I had started from four years before with one difference, I knew a lot more about sugar’s effect on the body. Previously, I knew my childhood dentist warned against candy and I knew sugar wasn’t helping me loose those extra pounds I was carrying but now I knew about insulin sensitivity, sugar’s link to cancer and other diseases, and sugar has even been associated with premature aging. But even my vanity can’t keep me out of the candy aisle. Generally speaking I’m very grateful for my life and experience a great deal of happiness most days but I’m also tired. Tired of dealing with the constant cravings. Tired of the guilt that I put on myself for the sugar binges. Tired of worrying that I’m going to get cancer from all the sugar. I really just want to be able to go to open a pint of ice cream and not eat the whole thing. I really want to be able to eat a few Hershey Kisses and not a whole bag. I really want to be able to keep my kid’s Christmas candy in the house and not think about it all day. So that’s where I’m at. People who know me well know that I’m stubborn as hell determined. I’m determined to understand and overcome this addiction. It just may take me awhile and while that’s not very inspiring, it’s honest. Sugar may have knocked me down but I’m not dead. If you have any advice I’m all ears. Check out our family’s adventures at Newschool Nomads as we travel in our RV through the United States! I started following you because I stumbled upon your blog a few years ago when I searched the words “home made figure suit” I was about to compete in my first figure show and I was trying my best to figure out a less expensive way…lol. I too have a sugar addiction. Once I eat a piece, I’m done. Then I eat and eat until it’s gone or that’s all I think about. I remember your post about hiding around the corner of your house eating syrup. Crazy thing…that had been me the night before. In the fridge and downing pancake syrup on top of a whole container of cool whip mixed with peanut butter. YIKES! 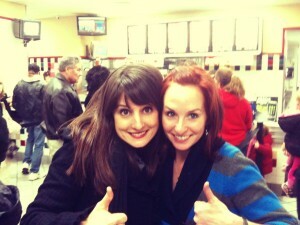 When you blogged that you were going cold turkey, I applauded you! That’s an amazing feat and you are VERY determined! LOVE THAT! I have never gone cold turkey, but thru my figure competitions I have learned to go without for some time. I even remember during my prep thinking “I could eat like this forever”…Then boom!!! End of contest and I eat candy, cookies, etc. I am back a square one with a sugar addiction like no other. For me, I think it’s going to be just cutting it out like you did! I’m sorry you’re dealing with this again, and that it’s bothering you. I have no advice. Just solidarity. I’ve been eating a silly amount of sugar in the last few weeks too. Maybe it’s in the stars. Frustrating and maddening. Grrrr. Yesterday I ate a solid breakfast and then the rest of the day, sugar. No real food, no meals, just treats. Today same thing. The madness needs to end. Urrgg, sugar… mine is driven by emotions and stress. I remember the moment I figured it out. My mom and I were in a deep discussion about her childhood (which was very stressful) and after she finished sharing with me, she said “Now, who wants cake”…lol. I realized then my addiction to sugary sweets came from her childhood. I am using Essential Oils (Grapefruit and Citrus Fresh) to cleanse my body and stop sugary cravings. I will let you know how my journey progresses. Let me know if you need any info on these. I love your honesty and sharing with others. Hope you all are traveling safe and getting ready for a beautiful Christmas. Ugh. Sugar. It’s funny, because some forms of sugar I can’t resist, but others I have no problem with. Sugary cereal is all but banned from my house because I will eat the whole damn box, but I have a bag of hershey kisses in my pantry that has been there for a week. I eat a couple a day and I’m good. Cookies? NOPE, I eat the whole batch. M&Ms….I can eat a handful and walk away. Chocolate bars? I’ll eat a square or two and be good. Chocolate chips? I’ve been known to eat half a bag in a single day. No rhyme or reason. I’m just weird. This is a great post and hits the nail on the head for just about everyone….including me !!! Really like the comments as well. It’s good to know that we’re not alone in this sugar addiction. I think I am one too, especially after a meal. I find I’m sneaky about it too which to me is a sign of sure addiction. I’ve just necked half a chocolate bar….while hiding it in my drawer 5 minutes ago…. I just wish I could out train a bad diet – although my diet isn’t bad, it’s just the sugar treats inbetween the good meals….damn…. Yes. Me too. Even drinking the maple syrup! It’s so shameful and horrible for my body. I really need to and want to stop but somehow I have back-slid from where I was 2 years ago and it’s a bad place. The sugar addiction is really bad. In my opinion its the same thing with alcohol or tabaco addictions! As a dentist I can tell you that most all people agree with you. Looks like your travels are fun! Well yes, I think sugar is a drug and we are not taking it seriously. All the major diseases or disorders are close connected with sugar consumption. The old story about sugar addiction. Sugar is plain and simple dangerous! Diabetes is a common disorder this days and this only because our food is overwhelmed with sugar.